High-impact sponsorship opportunities at the most comprehensive fleet event in North America. NACV gathers together the industry's top decision makers, influencers and purchasing authorities all in one place. NACV 2017 was an incredible success and NACV 2019 will be even bigger. Save money on your next big ad campaign by getting direct exposure to the hard to find qualified buyers you've been looking for. It has been proven again and again that companies who invest in sponsorship placements receive considerably more booth visitors. Becoming a sponsor shows that you mean business. Announce yourself as a major player with high exposure ads that set you above the competition. Check out our Sponsorship Guide for detailed Opportunities. Great! We'd be happy to help. Contact our operations manager today and we'll figure out the best way to promote your brand. Which Sponsorship is Right for You? 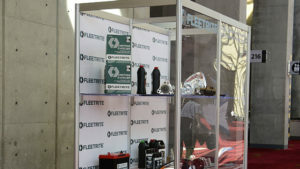 Showcase your products and services to show attendees. Advertise your company products and services on our show’s official mobile app! Users will click your static-banner advertisement to be redirected to your products and services. Your advertisement will be placed on the mobile app’s landing page, the first one to be seen by users. With many people basically living through their mobile devices these days, this is an excel- lent way to share your brand with those “on the go”! Advertise on the big screen! Your company’s video-advertisement will be shown on multiple large interior Video walls and tv screens for all to see. Logo included in NACV Show App splash screen Two message alerts pushed per day to all users Choose one product category to be included in as the footer upon search One tile on the main screen with your content and link back to your website. Now that we’ve got their undivided attention, let’s showcase your brand for all to see! Wouldn't it be great if all your effort at the NACV Show continued working for you the 103 weeks between shows? Now it can, with an NACV Virtual Booth Tour video! Book time with our experienced video crew and record a guided ‘virtual’ tour of your booth, go in-depth on a new product or service, or give a product demonstration. 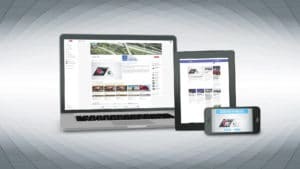 Our talented team of editors will then craft a dynamic and engaging 2- to 3-minute video you’ll be able to leverage in your marketing efforts long after you’ve left the excitement of the show floor. Click Here to Learn About Virtual Booth Tours! Advertise your products and services on the official NACV Show 2019 website! Your clickable banner advertisement will be live for one full month, leading visitors directly to your products and services. This convenient method allows prospective and registered attendees to learn about what you offer and why it’s of value to them. Also, they’ll gain a sneak preview of what you’ll present at the show. Advertise your company in the official Show Guide, which will be received by all attendees. Featuring comprehensive exhibitor and product information, the Show Guide is an excellent resource for attendees during and after the show. In conjunction with your advertisement, you’ll also be featured in the online Directory of Exhibitors. Display your company logo on official show products and documents. Get your brand noticed early and often by show attendees! Your brand will be visible down the main aisle of two halls. They’ll continue to spot your logo while locating other booths, prompting brand recognition. Allow attendees to carry your brand and booth number around in their pocket! Following a productive day at the show, attendees will see your logo as they enter their hotel rooms daily. Accordingly, your company will be on their minds as they turn in for the night while reflecting on the enjoyable events from that day. Be the official sponsor of NACV Show 2019 Registration, a step that must be completed by all attendees. While making their rounds through the exhibit hall, attendees will continually spot your brand along registration signage. Registration starts the attendee experience, and so can you! Sponsor the official NACV Show Press Room, where media members congregate and work behind the scenes. Th s is an excellent opportunity to have your brand noticed by key industry publications from across the country. Your Sponsored by Logo included in "Welcome Media" sign outside of the Press Room. Attendees will see your brand as they board shuttle buses headed for the exhibit hall, and again when they arrive to the drop-off station. Accordingly, they are sure to associate your company with their excitement and anticipation for what’s ahead. Attendees will see your brand as they head out, reiterating you as an integral component of the show. Display your logo on the coat check station, and on all coat tags distributed. 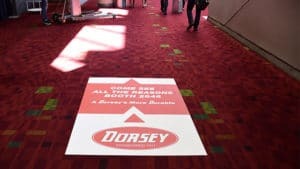 This is an excellent way to get your brand noticed by attendees as they drop off their coats upon entering the show, and again as they retrieve them before leaving. Feature your logo on branded notebooks and pens to be used by attendees during educational sessions at one of three separate theaters. With your logo at attendees’ fingertips (literally), they’ll associate your brand with their enjoyable learning experience. After all, knowledge is power! As attendees enter the exhibit hall, they’ll see your products while feeling anticipation and excitement for what’s ahead. Accordingly, they’ll bring your brand with them as they embark on their journey through NACV Show 2019. In conjunction with the Welcome Bag all attendees receive upon entering the show, you can include your logo on a branded insert for this handy bag! These branded inserts provide support for bags as they fill up with literature throughout show. Let your brand guide attendees through the show, step by step! Your logo will be featured on floor decals located throughout the high traffic hallways. These branded decals are sure to lead the way towards your booth. Sponsor interactive events for attendees to share information and ideas through collaboration and teamwork. Showcase your brand across convenient food bars and on appetizer napkins. These popular stops will allow countless attendees to see your logo while networking with snacks. Also, they’ll be carrying around your brand on napkins, a great conversation starter! Cheers! Display your logo for happy hour patrons while they partake at the Show Floor Welcome Reception, associating your brand with the good times ahead. At show’s end, exhibitors and attendees will again see your brand as they partake in last minute networking at the Closing Reception, with your logo symbolizing the completion of a successful show. Contact us, and we'll help you figure out a winning sponsorship strategy to promote your brand.